One of the advantages of running a website is that we are accessible to anyone with an Internet connection. 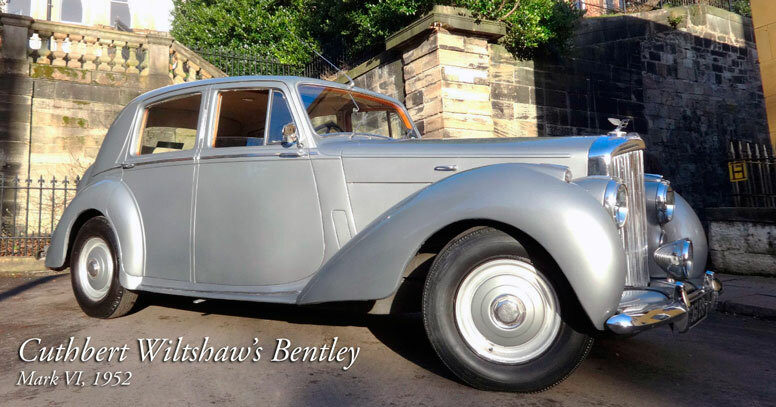 A website can also enable easy contact, as was the case when I received a query from Brian Plummer, who had just bought a Bentley Mark VI made in 1952. Mr. Plummer wrote to say that the car's first owner was a Mr. C. Wiltshaw of Carlton Ware and asked if we knew anything about him! He had come to the right place. As many of you know, Cuthbert Wiltshaw owned and ran Carlton Ware between 1918 and his death in 1966. I replied with some details and asked Mr. Plummer to send pictures of the car, which he kindly did and so some are included in this article. 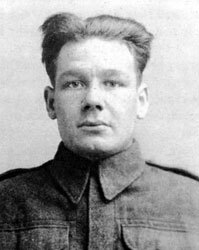 I was particularly interested in the car because its misuse might have led to the brutal murder of Alice Maud Mary Wiltshaw, Cuthbert's wife. There is a detailed account of the terrible offence in Staffordshire Murders by Alan Hayhurst, which was first published in 2008. 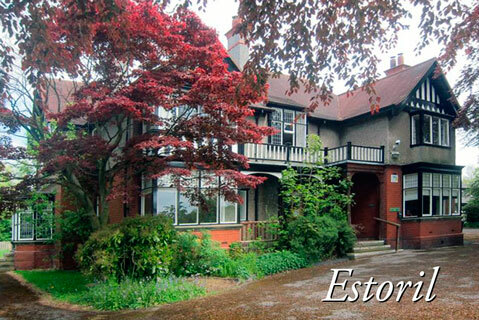 The crime was committed on 16 July 1952 at 'Estoril', the Wiltshaw home in Barlaston, some six miles from Carlton Ware's Copeland Street works. At Carlton Ware World's Annual Get-together in the Potteries in 2005, we visited the large house, which at that time was part of the Wedgwood Memorial College. To the right of the substantial building is a separate motor house with accommodation above. This is not visible in the photograph shown here but is where Mr Plummer's Bentley car must have been kept, though not for long, as we will discover. Of the crime, The News of the World ran the headline 'Most Vicious Murder of the Century'. So what has the car to do with the heinous crime? And, as if in stereotypical crime fiction, a gloved hand and a poker were involved. 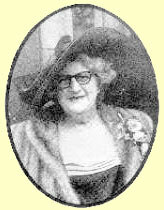 The killing of Mrs. Wiltshaw was far too horrifying to go into any detail. 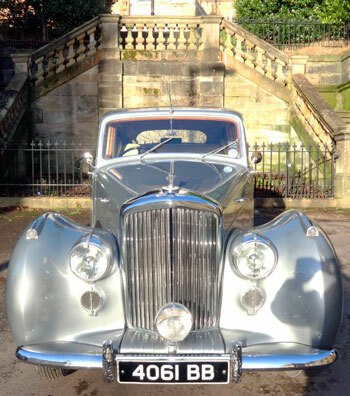 Alan Hayhurst's book says that Green was sacked in May 1952, but most significantly the new owner of the car told me that the Bentley was first registered on 15 July 1952, one day before the murder. Clearly, it was not the car that Green had driven for Cuthbert Wiltshaw. I don't know if Mr. Plummer will be relieved or disappointed! In any event, it makes an interesting story, though the brutality of the murder is most disturbing and must have been devastating for the Wiltshaw family. When, as a student in the 1970s, a flatmate bought a second hand Mark VI, I remember travelling in it to visit my parents. In those days, large old cars were inexpensive to buy and as engineers we were not too daunted if they went wrong. This one had a battery that kept going flat. Conveniently, my parents lived on a hill, the perfect place from which to start the car. 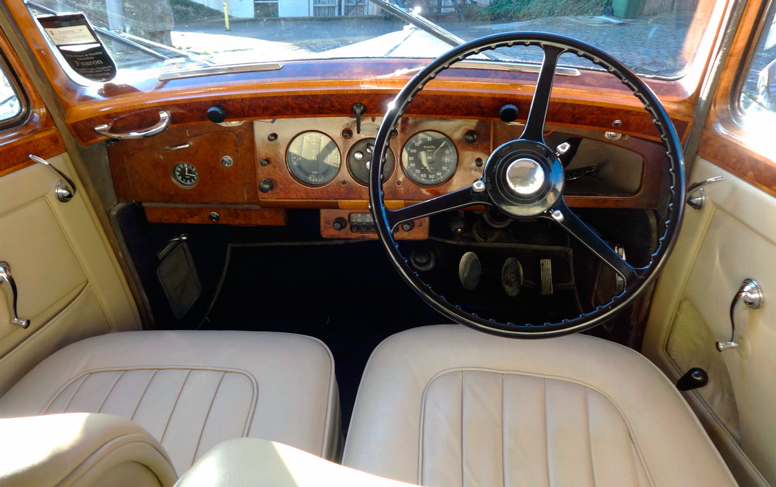 A quick release of the handbrake and the heavy beast with its 4½ litre engine, once having gained sufficient speed, could be started off the clutch. I recall neighbours saying how silent the car was as it glided down the slope. "You couldn't even hear it starting up." they remarked. I didn't have the nerve to disillusion them. Mr. Plummer's Bentley did not spend long at Barlaston, because shortly after the murder Hayhurst tells us that 'Estoril' was sold. In 2005, I stayed in the spacious Edwardian house to discover that it has a striking Art Deco bathroom with walls covered in eau-de-nil and black ceramic tiles with matching bath, washbasin and WC. This is an opportune moment to look at other Carlton Ware cars, this time with a more pleasant narrative! There was a large appetite for novelty teapots in the latter part of the twentieth century, which reached a peak in the 1990s. The craze was started in the 1970s by a coterie of young potters leaving Art College to set up on their own. A prime example is Roger Michel and Danka Napiorkowska and their Lustre Pottery, started in 1972. This led to a highly successful association with Carlton Ware, initially with Roger and Danka's Walking Ware tea sets, because their small pottery in Yorkshire could not produce sufficient quantities to supply demand. There were many other innovative and freethinking potters and amongst them were Jenny & Geoff Morten. 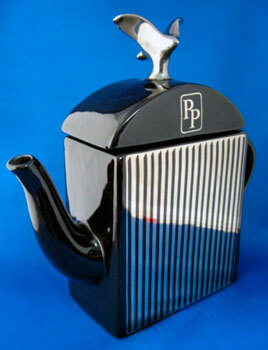 They were responsible for the PRESTIGE car radiator teapot shown here, which was clearly based on a Rolls Royce, though presumably altered to avoid any copyright infringement. I believe it was initially made at their studio in West Norwood, South London. Backstamps suggest that it was first produced there in 1978. As with Lustre Pottery's Walking Ware, it was subsequently made by Carlton Ware. The amusing teapot had a matching cream and sugar and was also available in white with silver lustre. All are shown in Carlton Ware sales literature of the 1980s, as were other J&G Morten designs. Whilst researching for this article I discovered, sadly, that Geoff Morten died in 2009 in California, to where he and Jenny relocated in 2003. Jenny Morten now lives and works in Bridlington, East Yorkshire. 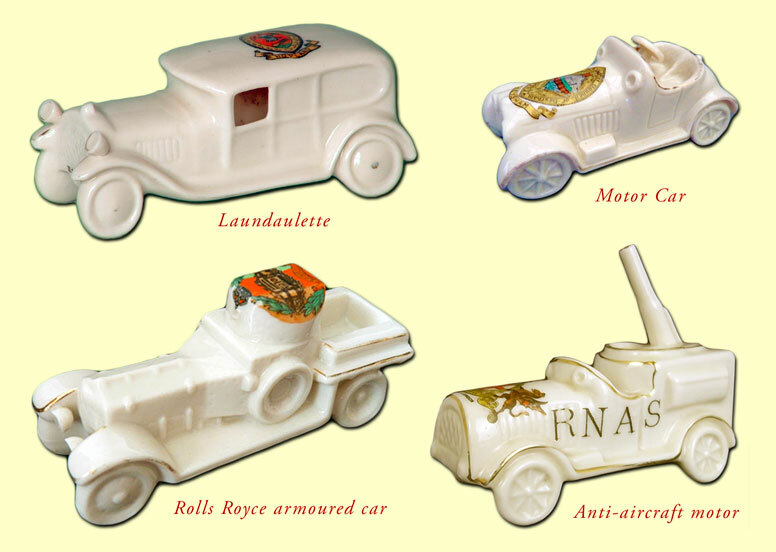 The first Carlton Ware models of motor cars related to the World War One, a Rolls Royce armoured car and an Anti-aircraft Motor. Two others were listed in a Carlton Heraldic China catalogue as a LAUNDAULETTE and a MOTOR CAR. You can read about all Carlton China relating to the First World War by clicking here. The Carlton Ware Bullnose Morris and MG No.1. In Issue 3 of The Carlton Comet, which we published in 2005, Terry Wise wrote an article on two Carlton Waremodels of vintage cars. These are shown below with variations, along with his introduction to the models, which tells you about them and when they were introduced. "Carlton Ware produced a wide range of advertising items for the brewing industry, most notably for Guinness. The motor industry also used the pottery as a means of promotion when two ceramic models of vintage cars were made. The first was a Bullnose Morris for the British Motor Corporation. This was introduced in the early 1960s and has shape number 2477 but was also made for British Leyland at a later date. The other was a model of the first MG ever made, known as MG No.1 . The Carlton Ware replica, shape 3132, was commissioned by British Leyland in 1974 to celebrate 50 years of the MG marque. Both models were mounted on a rectangular plinth printed with advertising logos and the name of the vehicle. The miniatures came in fancy presentation boxes in either cream or black, with gold hatching." 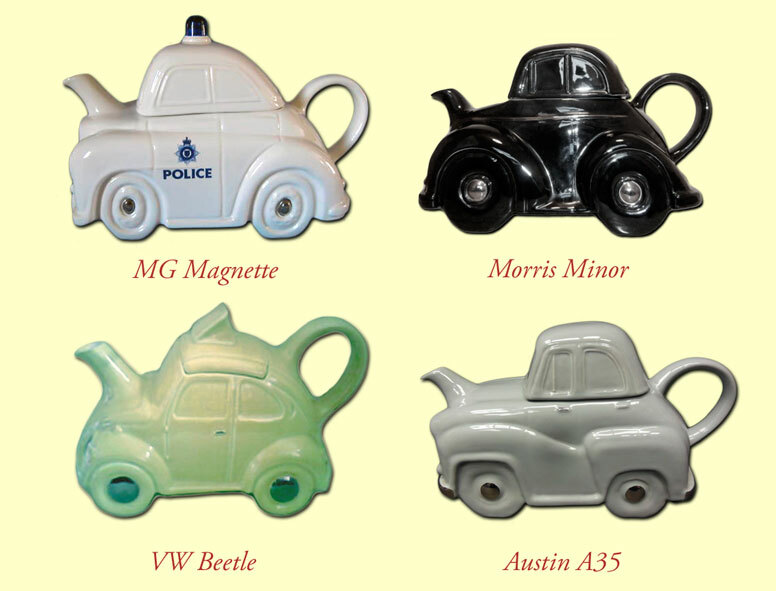 When John McCluskey bought the Carlton Ware trade name in 1989, a time which was close to the height of the novelty teapot craze, he introduced five models based on well-known cars from the 1950s and 60s. The first was based on the Mini and is a good representation of the popular car. (If you read this, John, do get in touch and let me know of any errors - Harvey h...@carltonwareworld.com ). The following four models were more cartoon-like, as you can see from the images below. They were loosely based on the MG Magnette, the Morris Minor, the VW Beetle and the Austin A35. The MG Magnette was used by the police as pursuit cars and featured in many films from the 1950s. With all four models, Enid Blyton's Noddy's car springs to mind! 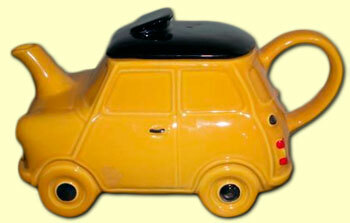 When John McCluskey sold the Carlton Ware trademark to Frank Salmon in 1997, Mr.	Salmon continued to market these car teapots, using various potteries to cast and decorate them. He offered the models in a wide range of decorations. To my eye, some of these later versions appear more crudely made and painted. I understand that Mr. Salmon has ceased contracting out the making of pottery to be backstamped with the Carlton Ware trademark. If so, it is possible that the moulds for these teapots will be sold on and more will be made, though not necessarily with a legitimate Carlton Ware backstamp. This turn of events usually means a reduction in quality of manufacture. Many thanks to Brian Plummer, Alan Hayhurst and Terry Wise, as well as Enid Blyton's illustrator, Harmsen van der Beek. Harvey Pettit © Copyright 2017. All rights reserved.